Edd participated in the Oriental & Persian Rug Event held in San Diego, CA, July 2013. The Rug Mastery courses included Rug Weaving and Rug Identification. Hand Woven Rugs can take months, often years, to weave. Knots are tied one small knot at a time. These Natural Fiber Textiles require special care. All attendees at this event were accomplished rug cleaners invited to advanced workshops on understanding how to identify where and when rugs are woven and how that has an impact on how they are cared for. 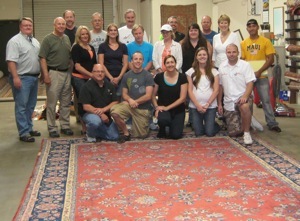 The event was hosted by K.Blatchford's Rug Cleaning Company of San Diego. Weaver Kate Blatchford gave several days of hands-on rug repair instruction to those seeking to strengthen their rug repair skills. Textile Experts Lynn Tall and Lisa Wagner teamed up to teach the rug identification course to help everyone to recognize how you can determine how rugs from around the world differ from one another. Lynn Tall is the founder of Rug Advocate, a rug consulting/teaching company, and resident rug expert of TLC Experts, a Fort Pierce, Florida-based cleaning and restoration company. Lisa Wagner is the founder of Rug Chick blog, a rug education and training website, and the co-owner of K.Blatchford's Rug Cleaning i San Diego. Local Rug Cleaning Guru, Edd O'Donoghue, owner of Pressluft Carpet & Oriental Rug Cleaning, joined others in dedicating several months of online study leading up to the hands-on rug workshops in order to deepen his rug expertise. Mr. O'Donoghue shares, “We handle rugs in our facility that may be several years old, or more than a century old. The more we know about the country it ws woven in and the quality of the work, the better service we can provide our local rug owners. These hand woven rugs are a piece of a weaver's life, and we want to make sure they can last for generations to come”. For more information about rug care for natural fiber rugs and other fine textiles contact us.